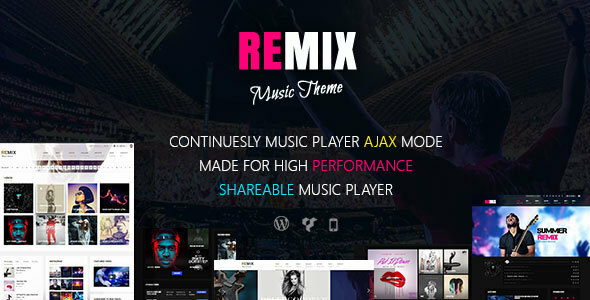 Remix – Music and Musician Ajax WP Theme Created by Codevz. This templates have specific characteristics, namely: Remix has features such as High Resolution: Yes, Widget Ready: Yes, Compatible Browsers: IE9, IE10, IE11, Firefox, Safari, Opera, Chrome, Edge, Compatible With: WPML, WooCommerce 2.6.x, WooCommerce 2.5, WooCommerce 2.4.x, WooCommerce 2.3.x, WooCommerce 2.2.x, bbPress 2.5.x, Visual Composer 4.11.x, Visual Composer 4.11.2.1, Visual Composer 4.9.x, Visual Composer 4.9, Visual Composer 4.8.x, Visual Composer 4.7.4, Software Version: WordPress 4.6.1, WordPress 4.6, WordPress 4.5.x, WordPress 4.5, WordPress 4.4.2, WordPress 4.4.1, WordPress 4.4, WordPress 4.3.1, WordPress 4.3, WordPress 4.2, WordPress 4.1, WordPress 4.0, WordPress 3.9, WordPress 3.8, Columns: 4+ . You can use this Remix – Music and Musician Ajax WP Theme on WordPress category for ajax, artist, audio, dj, events, gallery, mp3, music, player, podcasts, radio, rtl, shop, soundcloud, visual composer and another uses. Remix is modern glass version wordpress theme fro music sharing, Multipage + One page theme with responsive layout built using 12 column grid system, Supports unlimited colours and sidebars, Suitable for music, band, club, party, event, magazine, classic, artist, jazz master, punk rocker, soprano singer, piano player, band manager or even a webmaster, etc websites. Integrated with Visual composer Drag n Drop Page Builder, Revolution slider and master slider premium wordpress plugins (all worth $100+) saves you handsome money and embed MP3, Soundcloud, Shoutcast and radionomy audio. Masonry and listing blocks for all post types. Finally remix is best wordpress music theme 2016 for music lovers.